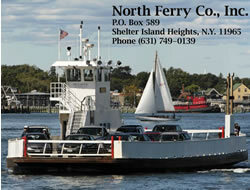 The North Ferry Company offers ferry services from Shelter Island to Greenport, Long Island. Cars, passengers, and trucks are ferried across and it takes about seven minutes for the crossing. This ferry service is available all year long. The North Ferry Company may be contacted at 631-749-0139. You will love taking the ferry from Long Island to Shelter Island no matter whether it is for fun, business, or vacation. There is a lot to learn about Shelter Island and while the trip across is quick it is really enjoyable to have the sea mist in your face and the wind in your hair. It really is a historical trip because Shelter Island is listed in the United States Register as a historic place. When you visit the Island it is really like heading back in time because when it was designed in 1872 it has not changed much since then. It's a beautiful example of landscape architects and the rural area is very naturalistic and charming. Some of the architects taking part in the design include Frederick Law Olmsted, who designed Central Park in New York, as well as Robert Morris Copeland who designed the original plans for religious outings. When you arrive to Shelter Island and see the Union Chapel, which was built in 1875 and became part of the national register in 1984, you will be in awe. You can actually see in your mind's eye the religious meetings that took place here and the people standing out in the Grove, a natural amphitheater, where the first camp meetings took place.